In today's edition of The Hindu, V.R. 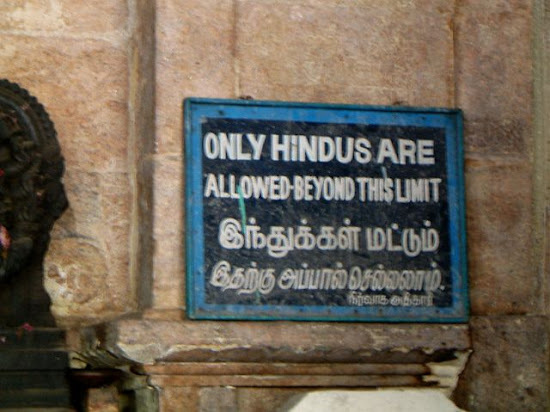 Devika asks some pertinent questions: Why are non-Hindus not allowed into temples? Also, how do you recognize a Hindu? I've been to many, many temples across South India and wasn't able to enter the sanctums of most. At the Jagannath temple in Puri, Orissa, non-Hindus are not even allowed to enter the temple complex! However, I have non-Hindu friends who have entered Hindu temples which are supposed to be out of bounds for them. How is it that they were able to enter these holier-than-holy places and not I? Simply because they're Indian and therefore are assumed to be Hindu. As V.R. Devika points out, the rule seems to only apply to "well known non-Hindus or white skinned people". just want to say I couldn´t enter the Golden temple in Varanasi for the same reason: not being a hindu. My driver said it was for security reason such as terrorism attack. Maybe true, maybe not. One never knows for sure in India.